Of course, guests are not limited simply to road transport as the train station of ‘La Giustiniana’ is just nearby. From there, one can catch fast trains into the centre of the city that also stop right at the Basilica of St Peter in the Vatican. Our highly trained multi lingual staff are on hand 24 hours a day to assist you and we offer a host of quality services. 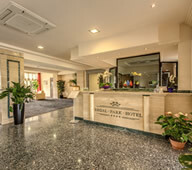 See our Rooms & Services page for more details. 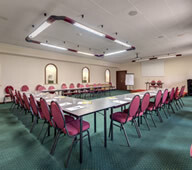 Our dedicated Business Centre and Conference Facilities offer the latest audio-visual equipment and facilities, complimented by our catering and banqueting features. 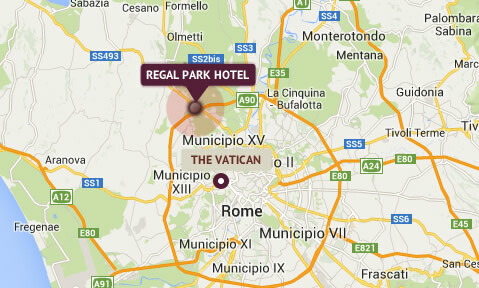 The Regal Park Hotel Rome lies just to the north of the Vatican along the famous Via Cassia which gives direct road links to the centre of Rome in one direction, and the beautiful Lake Bracciano in the other. Guests not only have the easy access to such sights as the Vatican Museums, Sistine Chapel, Castel Sant’Angelo, the Spanish Steps, the Trevi Fountain and the Coliseum within reach, but the wealth of natural beauty in the area means that guests can relax like an emperor or pope of old. If you relax best with activity, the surrounding area is great for hiking, bike rides or the leisurely round of golf. Direct access to key places as the Vatican, Sistine Chapel, Castel Sant’Angelo, Trastevere, Testaccio, Termini, the airports, the Coliseum and more. Easy access to the beautiful nature reserve, breathtaking countryside, Lake Bracciano, historic local towns, outdoor activities and golf.